Al Barros was born in Honolulu, HI, and raised in both Honolulu and Colorado Springs, CO, graduating from Wasson High School in Colorado Springs in 1974. He has a Bachelor’s Degree in Criminal Justice from the University of Nebraska at Omaha, an MS in International Relations from Troy University, and an MS in Strategic Intelligence from the Joint Military Intelligence College. Al served 21 years in the U.S. Air Force, retiring in 1998, and subsequently served 20 years for the federal government, retiring in 2018. He married Beverley Safrit in 1980, and has two adult daughters and two grandsons. Al was ordained in June of 2010 at the Basilica of National Shrine of the Immaculate Conception in Washington, DC, for the Archdiocese of Washington. 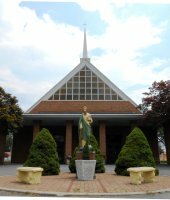 Upon retirement, he moved to Milton, DE, and was subsequently assigned to St. Jude The Apostle Parish in July of 2018.